Summary: Black didn’t know its name, but he knew it lay deeper and higher than any other place Americans had ventured. You had to travel through a network of interlinked valleys, past all the other remote American outposts, just to get to its mouth. Everything about the place was myth and rumor, but one fact was clear: There were many valleys in the mountains of Afghanistan, and most were hard places where people died hard deaths. But there was only one Valley. It was the farthest, and the hardest, and the worst. When Black, a deskbound admin officer, is sent up the Valley to investigate a warning shot fired by a near-forgotten platoon, he can only see it as the final bureaucratic insult in a short and unhappy Army career. What he doesn’t know is that his investigation puts at risk the centuries-old arrangements that keep this violent land in fragile balance, and will launch a shattering personal odyssey of obsession and discovery as Black reckons with the platoon’s dark secrets, accumulated over endless hours fighting and dying in defense of an indefensible piece of land. The main character in THE VALLEY is Lieutenant Black. Black is stationed at “relatively safe” Forward Operating Base Omaha in Afghanistan where he is relegated to desk duty after losing a platoon in an ambush. Frustrated and bored, Black has decided to leave the Army but he must first complete one last assignment before he tenders his resignation. Black is assigned a 15-6 investigation concerning a civilian complaint in the province of Darreh-Sin. Typically a rather benign initial inquiry into a possible wrongdoing, this task takes Black to Combat Outpost-COP- Vega, the most dangerous and remote base in Afghanistan. Black’s routine inquiry is met with not only a lack of cooperation but a deep disrespect and outright animosity from all those stationed at Vega. When Black inquiry takes him to Darreh-Sin to talk to the town’s leader about the complaint, he is quickly dispatched back to the base. Black realizes that the situation at COP Vega is not as it seems and the level of danger there is increasing rapidly. The events turn quickly from Black’s initial task to an investigation of what is really going on at Vega. Author John Renehan uses his prior experience as a field artillery officer in Iraq to give the reader a realistic view of the type of turmoil a soldier experiences at a remote outpost like COP Vega and how those experiences may affect him. The action is non-stop and the real-life situations are both eerie and suspenseful. Lieutenant Black may be the main character but the real star of the novel is COP Vega and the troops stationed there. Although I enjoyed the novel I did find that the military lingo and the large number of characters made it difficult to follow the action. I often leafed back through the book to keep the characters clear. The storyline, while fast-paced, was confusing and only cleared up to some extent in the final chapter of the book. 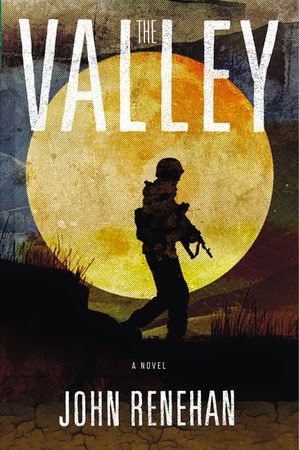 THE VALLEY is a nonstop, fast-paced and dark military thriller full of action and mystery. If you enjoy fiction involving military action, you will probably enjoy THE VALLEY. Thanks to the publisher for providing a review copy of this novel and thanks to Booking Pap Pap for his review. With the subject matter and all the characters this might not be for me.